Having such a complicated stereo setup, my home theatre setup will not be any simplier. Center to my setup is the use of octava 4 x 2 HDMI Matrix Amp which allows conversion of HDMI to analog output. I am, of course, not satisfied with the analog output. The reason I used this device is because I can modify it to allow digital SPDIF output. You need this. This add on board convert HDMI with 8 channels of audio music (up to 192KHz) to individual SPDIF signal with 75 Ohm impedance. The picture shown above showed the modified setup. 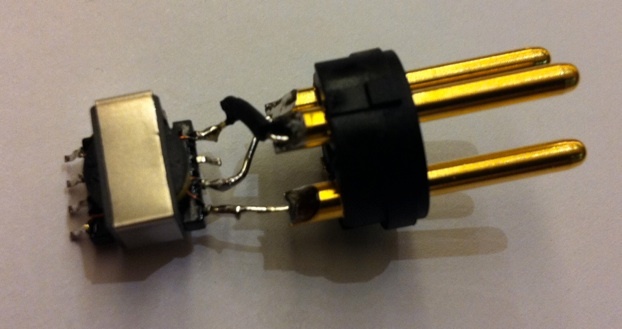 The SDPIF signal is then converted to 110ohms via scientific conversion transformer. It actually fits very well. This 8 channels information can than go to my convolver computer and ULN-8 and LIO-8 for further processing.